I actually really like these monochromatic miniatures, as I think they have enough detail to be distinguished from each other but are still abstract enough to not weaken the imagination. 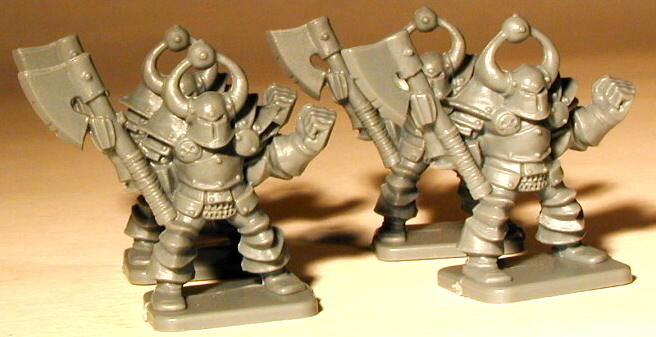 To my eye, they look better than the prepainted plastic miniatures I have seen. I don’t own any of these D&D board games, but now that Fifth Edition is looming, maybe these 4E-derived games will be available cheaply (and I’ve heard the games themselves are not bad). 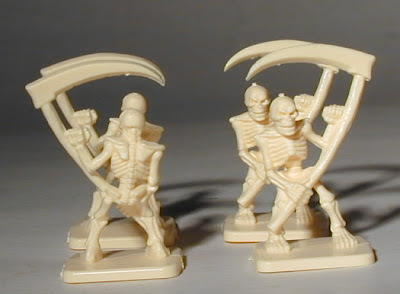 They also remind me somewhat of the old Hero Quest figures, which is a game I did own when I was younger. All hero quest images from this site. This entry was posted in Reviews on April 26, 2012 by Necropraxis. I’ve got Amazon price alerts set for all 3 of these games. If they drop to around half price I figure that they’re worth buying just for the 40 or so minis in each of them. The D&D boardgames are completely separate from 4E. Even people who hated 4E liked the board games. If their prices go down it will not be because 4E is ending. I have not played them, but I have read about them, and watched some tutorial games on YouTube because I was curious. “Completely separate” is an overstatement. 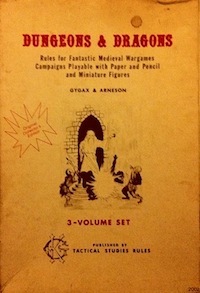 The rules do seem to be derived from 4E, and much of the terminology is the same. For example, there are healing surges (though I think they are shared by the party). The heroes have at will, daily, and utility powers. All the numbers are scaled down though (fewer HP, lower damage) and there is only one defense score, AC. In fact, it might be interesting to try to adapt such simplified 4E rules to a more freeform tabletop RPG (that still focuses on tactical grid play). You might still be right from a marketing point of view though. It’s possible that the bulk of the market for these games could care less about editions. I hope not though! In Canada, these games will run you $100 each based on current Amazon.ca prices. I recently picked up Expedition to Castle Ravenloft. Honestly, it already *is* cheap. 60 bucks for a board game with so many good quality pieces is a pretty great price. I’ll be playing it with my group for the first time next weekend, but I’ve played a few sessions already. It is quite a fun game, though it has a strong sense of 4th edition all about it, which I find a little off-putting. One of my players still has Hero Quest, which he’s held onto since he was 12. We’ve been cutting our Pathfinder games short lately, so we can try to get some HQ in. The board games are mighty tempting, indeed.